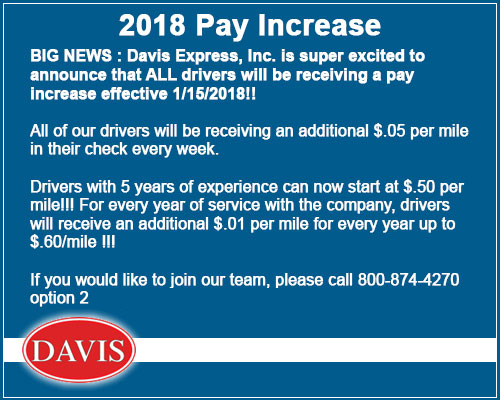 BIG NEWS: Davis Express, Inc. is super excited to announce that ALL drivers will be receiving a pay increase effective 1/15/2018!!! All of our drivers will be receiving an additional $.05 per mile in their check every week. Drivers with 5 years of experience can now start at $.50 per mile!!! For every year of service with the company, drivers will receive an additional $.01 per mile for every year up to $.60/mile!!! If you would like to join our team, please call 800-874-4270 option 2 to speak with a recruiter or apply online now.